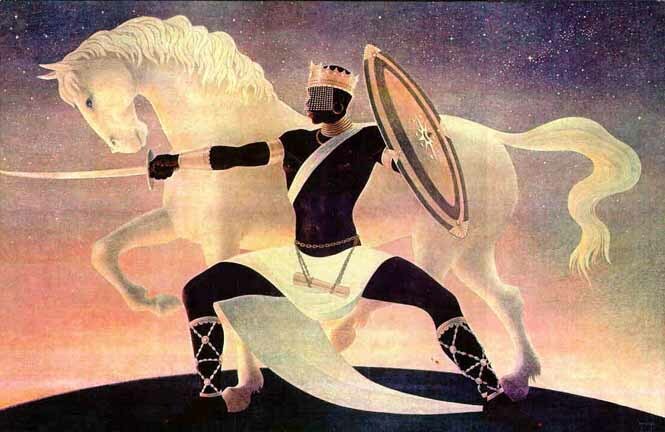 OBATALA, the King of the White Cloth, is the oldest Orisha. He is considered to be the Father of all the other Orishas, and since they are kings and queens, for us, he is King of Kings. There are 16 caminos of Obatala, eight of them male and eight of them female. He is the servant of Olofi, and under the direction of Olofi, he became the creator of the mankind. Legend goes that Obatala was very fond of palm wine, and one day he drank a little too much while he was engaged in his work of fashioning the bodies of those to be born. The result was that some of his creations were born less than perfect with deformaties in their bodies. Naturally Olofi scolded Obatala for his error and forbid him to drink palm wine while engaged in that most important work. Since that time, those born with deformaties are considered to be children of Obatala and it is forbidden to make fun of them. Likewise, albinos are considered to be children of Obatala.